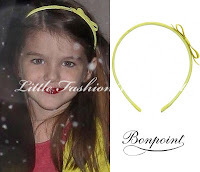 Suri Cruise is all smiles as she walks to school with Katie in NYC on October 22nd 2012.
outfit info: Estelle Hairband in Lime by Bonpoint,(first worn on February 10th 2010), Uniform Raincoat in Sugar Coral FW'12 by GAP, Black Patent Flats with Bow by Crewcuts (first seen on October 10th 2012) and carrying a Pink Leopard Print Junior Backpack by GAP from her 1st day of School. 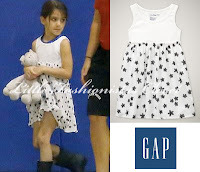 In Suri's Closet - H&M for Unicef! 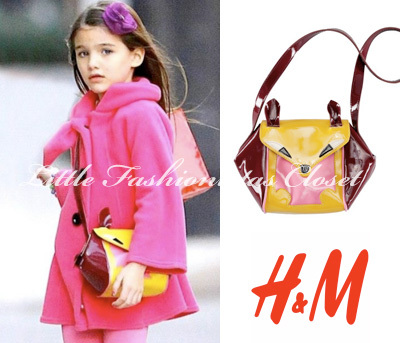 Suri was wearing an adorable Animal Leather Bag from FW'12 by H&M for Unicef, while out with friends on October 14th 2012. Thanks to Kasia (from Warsaw, PL) for the id! and enjoyed some bowling with Katie. and Fanti Blush Sequined Flats by Nina Kids (first worn on October 14th 2012). Suri pictured running to her Avenues school in NYC on October 18th 2012.
outfit info: Classic Dark Denim Jacket by GAP (first worn on October 15th 2012), Black Patent Flats with Bow by Crewcuts (first seen on October 10th 2012) and carrying a Pink Leopard Print Junior Backpack by GAP from her 1st day of School. 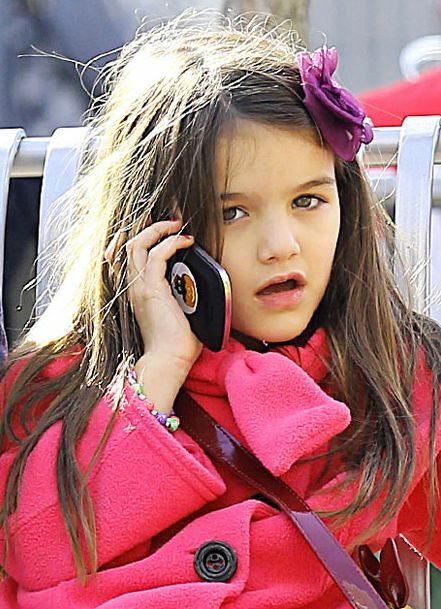 Suri was pictured on her way to school in NYC on October 16th 2012. 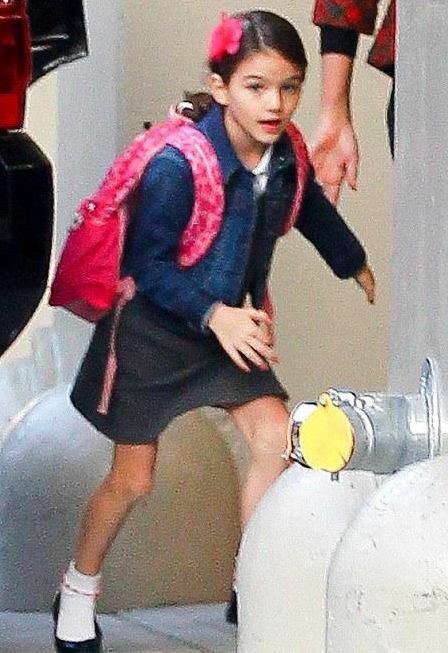 Suri pictured on the way to Avenues School in NYC on October 15th 2012. Suri was wearing Classic Dark Denim Jacket by GAP. outfit info: Hair Clip by Burberry, Black Patent Flats with Bow by Crewcuts (first seen on October 10th 2012) and carrying a Pink Leopard Print Junior Backpack by GAP from her 1st day of School. 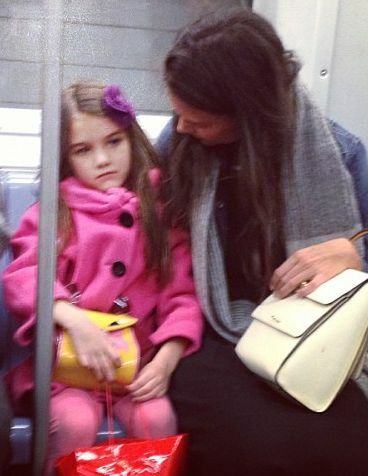 Suri & Katie used subway on their to playdate at the Battery Park, NYC on October 14th 2012.
. .chatting on her Blackberry phone. .
. .enjoying her playdate. .
Suri was wearing 3/4 Sleeve Fleece Coat in Pink (first worn in August 2012) by Barney's XO and Fanti Blush Sequined Flats by Nina Kids. Suri & Katie pictured arriving to their apartment building after school in NYC on October 10th 2012. 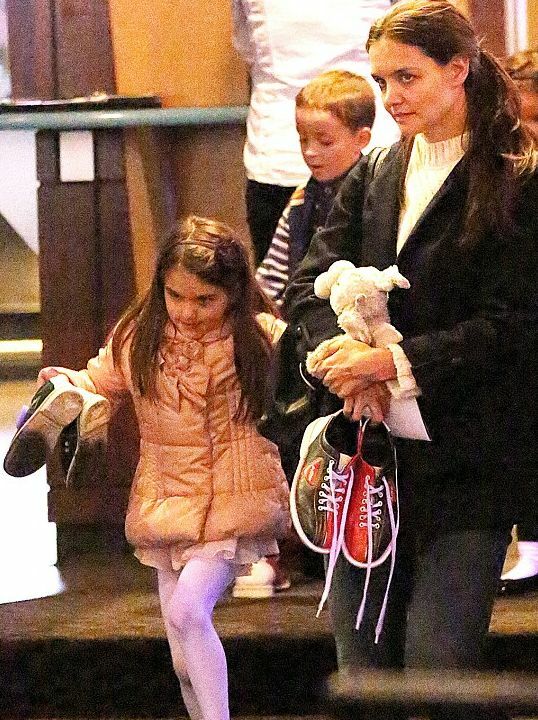 Suri was wearing Uniform Raincoat in Sugar Coral FW'12 by GAP and Black Patent Flats with Bow by Crewcuts. 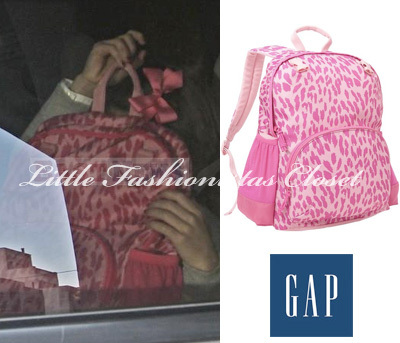 and carrying a Pink Leopard Print Junior Backpack by GAP from her 1st day of School. 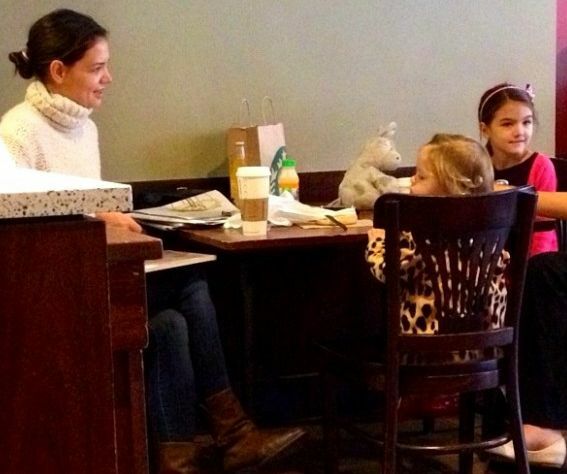 Suri & Katie spotted out in NYC on October 4th 2012.
outfit info: White & Black Star Print Dress from TG Havana line SS'11 by GAP and Gommette Red Ballerinas from Jeune Fille Collection by Roger Vivier (first worn on June 27th 2012). 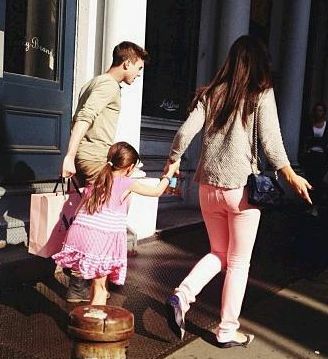 Suri was wearing Cupcake Dress in Aubergine FW'12 by Crewcuts. outfit info: Glitter Bow Headband in Ceris FW'12 by Crewcuts, Pink 'Always' Wrap Cardigan by Splendid Littles and Gommette Red Ballerinas from Jeune Fille Collection by Roger Vivier (first worn on June 27th 2012). Suri pictured arriving a dance class at Peridance Capezio Center, NYC on September 30th 2012. 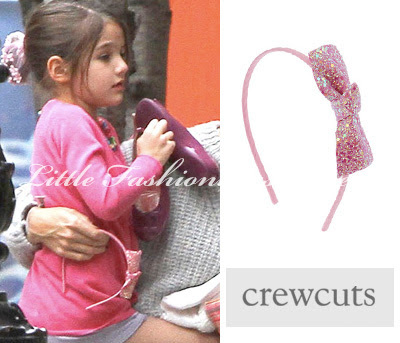 Suri was wearing Pink 'Always' Wrap Cardigan by Splendid Littles. 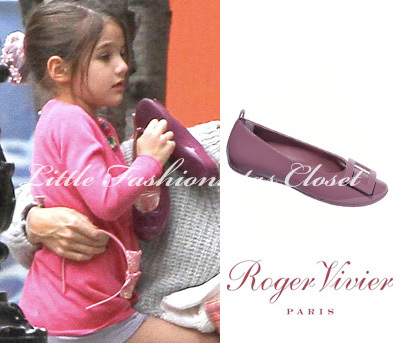 S&K were holding Glitter Bow Headband in Ceris FW'12 by Crewcuts and Gommette Purple Patent Ballerinas from FW'13 Jeune Fille by Roger Vivier (available at RV Bal Harbour Shop, FL). 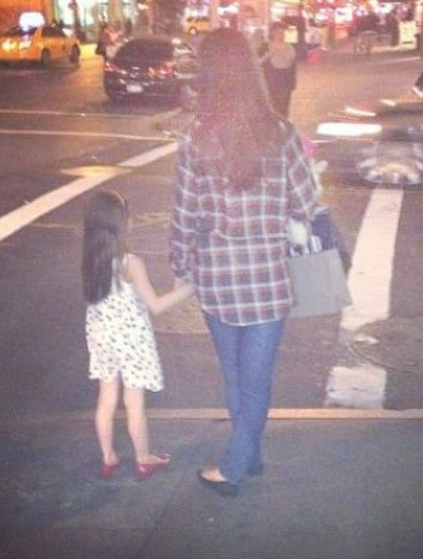 Suri & Katie went shopping at Brooklyn Flea Market in NYC on September 29th 2012. Suri was wearing Pink Mix Stripe Dress SS'12 by Splendid Littles. Thanks to Michelle for the id! 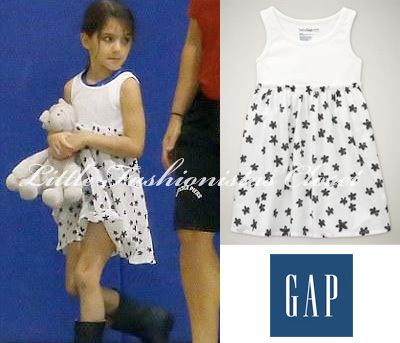 Suri attended a dance class at Peridance Capezio Center in NYC on September 29th 2012. Suri was wearing Saturn Dye Dress in Confetti Pink SS'12 by Splendid Littles and Contrast Sole Brown/Pink Boots FW'12 by Crewcuts.